Is the Worst Over for the Montreal Canadiens? Apparently, no one over there had gotten the memo that the Habs were set to play the last-place Buffalo Sabres that very night, a game that presented an excellent chance for them to plummet even lower in their well-documented crash back down to Earth, during which Montreal lost three-straight games to Chicago, the Calgary Flames, and Vancouver Canucks, the latter in overtime after coming back from a 2-0 deficit in the third period to earn a point. Needless to say, it wasn’t actually rock bottom. That’s life during hockey season in Montreal, though. Fans smell the Stanley Cup following a three-game winning streak and after a three-game losing streak? Forget the playoffs. I mean, will there even be a postseason, with the planet having just exploded and all? Obviously, the Habs didn’t lose that Sabres game (and they followed it up with a 4-1 win over the much more respectable Minnesota Wild this past Saturday for their second consecutive victory), but the 2-1 shootout victory in Buffalo was hardly convincing. Truth be told, even had Montreal wiped the floor with the Sabres, no one would have been really satisfied either. After all, these are the now-3-11-2 Sabres, we’re talking about, a team that has scored just 20 times (and given up 54 goals) in 16 games. Beating them, routing them even hardly proves anything. I mean if you don’t absolutely crush Buffalo, then something must seriously be wrong with you, right? Well, the Boston Bruins also needed an extra frame to beat Buffalo, while the Detroit Red Wings actually lost in a shootout to the Sabres. The San Jose Sharks got beat outright by them, in regulation. All three of those teams are in the playoffs currently. Really, no matter what the Habs did last Wednesday night against Buffalo, they couldn’t win, not in the eyes of a nation of fans who had already written off a team 13 games into a season, but just five after they went 7-1 in their first eight. That’s pretty ridiculous, right there. What’s most ridiculous, though, is that, following the Blackhawks loss, the Habs were 8-4-1 and still at the top of the Eastern Conference. Sure, it was more crowded at the top than it had been just a few days prior. But, putting it in the proper perspective, things can be a whole lot worse. The Toronto Maple Leafs are 7-5-2 right now, with two more losses than Montreal had then, on the outside of the playoff picture looking in, and they definitely have a lot further to fall, don’t they? They’re due for their perennial spring meltdown in just a few months. Rock bottom? Please. These Canadiens know nothing about rock bottom. The teams from 1998-2000 that missed the playoffs for three consecutive years? One campaign of which they didn’t even have an 18-goal scorer (1998-99)? One can definitely argue that they do. But, for the record, that’s not even the first time the Habs had missed the playoffs three years in a row in the NHL… that first happened from 1919-22. They also missed them their first four years in existence in the NHA, from 1910-1913. Are the Canadiens as good as their early-season 7-1 record might have hinted at? No, of course not. That would have put them on pace for a 144-point season. The 1976-77 Habs, which featured the just-honored Guy Lapointe and is widely considered the best team in NHL history, “only” had 132. That quote came in September 2010. That December, the Habs lost three straight to the Detroit Red Wings, Toronto Maple Leafs, and Philadelphia Flyers. Two weeks later, they lost another three straight to the New York Islanders, Washington Capitals, and Tampa Bay Lightning. It was a stretch during which the Habs went a God-awful 2-8. 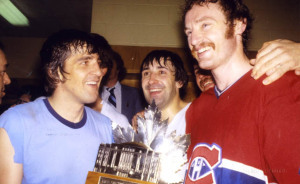 It was also a stretch that came during one of Price’s best seasons ever when the Habs took the eventual Stanley Cup-winning Bruins to the brink of elimination in the first round, losing Game 7 4-3 in overtime. So, no, the worst is not yet over for the Habs, because there will be more, longer-lasting valleys than mere three-game losing streaks to come this long 82-game season. The key, though, is that peaks present themselves much more often. There’s every logical reason to believe they will for the still-Eastern Conference-leading, 10-4-1 Canadiens.